Last month, the Samsung Galaxy A8 (2016) made its appearance on GFXBench revealing most of its specifications. Now, the device has been spotted on Geekbench. 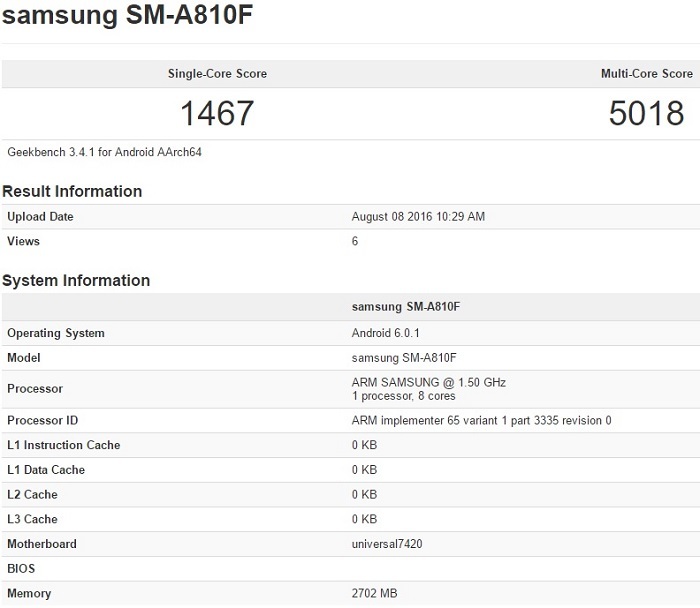 The Galaxy A8 (2016) that appeared on GFXBench carried model number SM-A810 whereas the one spotted on Geekbench carries model number SM-A810F. The device listed on Geekbench is powered by Exynos 7420 SoC which is coupled with 3 GB RAM and runs on Android 6.0.1 Marshmallow. The specs listed on Geekbench are in line with what we have seen on GFXBench. There’s not much information available on the Geekbench listing apart from chipset, amount of RAM and operating system under the hood. However, from what we have seen on GFXBench, the Galaxy A8 (2016) might feature a 5.1-inch Full-HD display along with 32 GB internal storage and a combo of 16 MP and 5 MP front and rear camera. Well yes, the model numbers on both the listings are different, hence, there might be a difference in the display size or the cameras. But again, as we always say, specifications listed on benchmarking websites can’t be considered final as things might change when the device is made official. The Galaxy A8 (2016) has also received Bluetooth certification so we expect the device to be announced soon.